7D mobile cinema is more like an interactive game. Its most distinguishing feature is the engagement of the audience. You have to use this electric gun to shoot different targets during the whole process. 7D Effects Cinemas use highly comfortable seating combined with a number of ‘in-seat’ effects. These include a range of 3DOF (degrees of freedom) and 6DOF seat movements, vibration, push back, leg ticklers, water spray and air blast. Combine these with ‘in-theatre’ effects such as bubbles, snow, wind, rain, aroma, fire, laser, smoke and lighting to give an amazing experience to visitors. 3seats/set but also 2seat/chair - 4seats/chair for you choose and there are several kind of color you can choose,we can also custom made the cinema chair as you want. 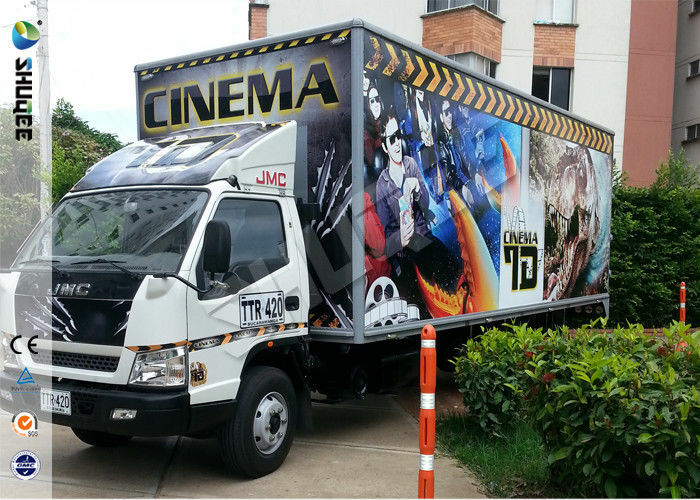 High quality truck mobile 7D cinema. Motion cinema chair with stop button. Supply over 100 movies for free. 6/8/9/12 seats for you to choose. More professional special effect system. Chair Movement Specification:Movement from left to right: 0-19°c degreen; Movement up and down: 0-200mm; Pitching moviement front and backward: 0-24°degreen. Lightning Simulation: Simulate lightning scenes in the film, emitting dazzling lightning, accompanied by the roar of lightning, so that the audiences feel like being at the height of summer thunderstorm days. Rain simulation: When the film for a rainy pictures, raining falling down. The audience will truly feel at this time rain fall from the sky, moist his hair and cheeks. Snow Simulation: Snow machine can efficiently and quickly to man-made snow falling down, making the snow full of the cinema. The audience in the world is dressed in white. Bubble Simulation: In the underwater world and underwater divers, aquatic animals and plants will spit out a lot of bubble, the bubble machine blown bubbles floating in the cinema. Windy Simulation: Simulate the wind. Simulation scene in the film blowing scene or a mass of gas flow, a few fan works can make whole theater airflow movement at the same time, the effect of the real wind. Smoke Simulation: Simulate combustion smoke. Simulation of the combustion produces a lot of smoke, smoke produced with "fire", as if the sky in the combustion. Simulation of mist, clouds fluttered among the audience. Flame Simulation: Simulation of the fire, flame effect. Combining with the smoke simulation, scene of combustion and flame, foil hot atmosphere. Laser Simulation: Special scenario simulation of light, such as discos, concerts, glaring color light; simulate the atmosphere of the film. Smell Simulation: Simulation scene in the film, like scent or strange taste simulation. Take the sense of smell on the true feelings. For all inquires about us or our products; we will reply you in detail within 24 hours. We own well-trained and passion salesman & after- sale services who can speak fluent English will serve for you. We offer OEM services. We can customize the goods according to customer’s need. 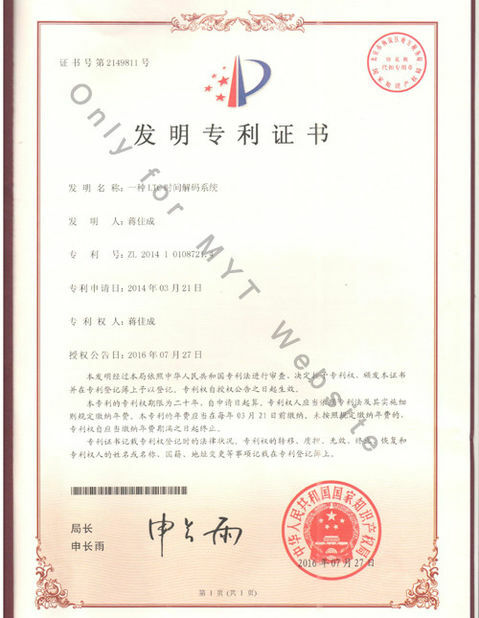 We have experienced R&D engineers and we have strong ability to do ODM projects. 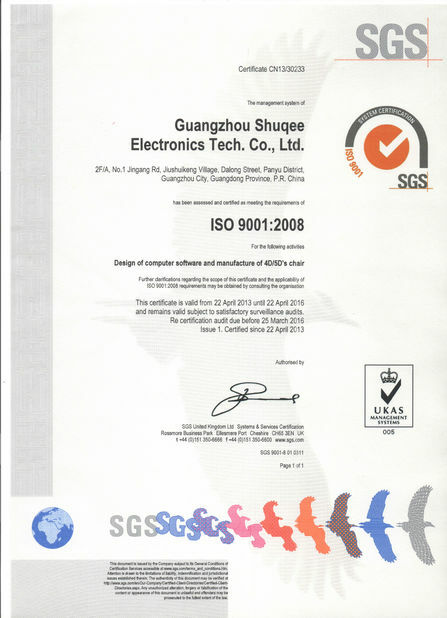 Each product will be strict inspection, ensure product quality before package, the products to a minimum of fault rate. We will provide comprehensive, systematic training for the client-side technician or operator. Also we will organize regular visit for a return according to customer feedback.